A warm welcome to new Donegal Democrat food columnist Peter Campbell. Peter, a professional chef, trained in Killybegs and has worked in the restaurant industry for over 20 years from establishments like the K Club, Bang Cafe to more recently as Head Chef in the Village Tavern Mountcharles, and now offering Outside Catering for all your events offering a wide variety of excellent local produce. He tailors his menus to suit your event providing a hassle free experience for you and your guests. 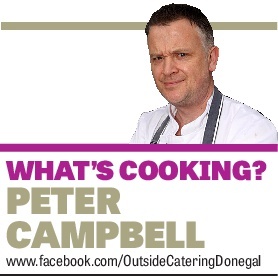 Over the past few weeks, we have been featuring Peter's 'What's Cooking' column in the pages of the Donegal Democrat. And we're delighted to bring you this week's column to our website. Happy cooking! This week we are going to look at getting the kids active in the kitchen and then next week ahead of the bank holiday we will suggest Picnic hamper ideas. Here are some easy kids lunch ideas where you can get them active in the kitchen help preparing Easy Quesadillas and Summer Milk Shake, they will devour them up! 2. Place the tortilla wrap on the counter in front of you and cover with the ham. 3. Over 1/2 only, sprinkle the grated cheese and the chopped spring onion. Scatter over the coriander leaves. 4. Carefully fold the tortilla wrap in half, that's to say, fold the untopped half over the cheese so you have a fat half moon. 5. Lift this is up carefully and brush each side with the oil before putting it on the hot griddle pan or under a hot grill for a minute each side. 6. Using a fish slice, transfer the tortilla to a board or plate and cut into 3 triangles. Eat with some salsa on the side. Add all ingredients into a nutri bullet or food processor and blitz until nice and smooth. Pour into your glass and top with fresh cream, sprinkles, a strawberry and enjoy!